That said, if both options are remote, what are some of the differentiating factors between them? Let’s have a look at how remote development teams compare to freelance software programmers. Freelance platforms like Upwork.com, Fiverr.com, and Toptal.com, appear to be first on the list when you consider hiring freelance software developers. 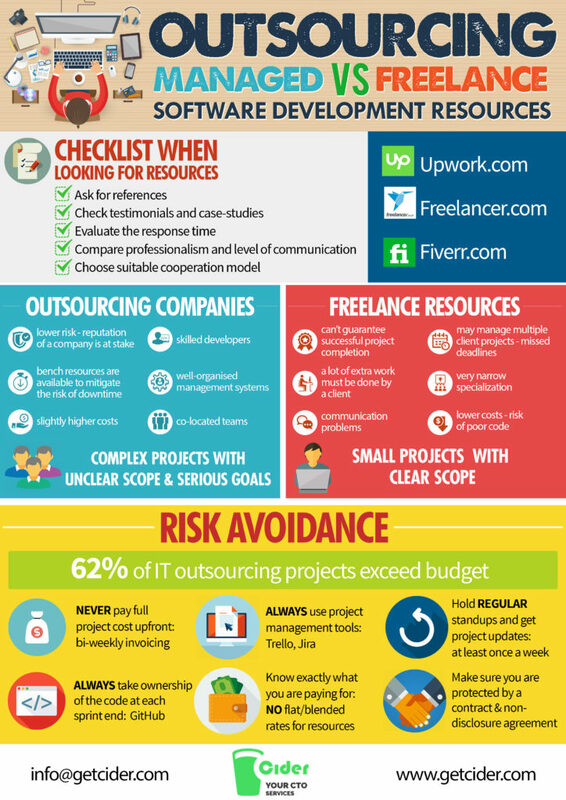 These and other platforms stand by the principle of gathering as many freelancers as possible. A growing number of freelancers leads to higher competition between the platforms and therefore lower rates. These portals offer an extremely polished process of finding a resource easy and fast. But wait, there is also a flip side of the coin. Can disappear and take the code. In case something unexpected happens, and the developer you’ve hired goes, who handles money spent and time wasted? Moreover, freelancers often have very narrow specialization, which is not ideal for a complex project. Business owners usually can’t predict what resources are essential to fulfilling their project needs. For instance, if you need to build a fully functional website, hiring just a developer would not be enough. You will need to create a team made up of developers, designer, QA, etc… Furthermore, with a team of freelancers, there is a lot of extra work that you will have to do yourself. It’s your responsibility to manage freelancers’ work once you’ve hired them, so you also should be their HR, motivator, career consultant, and cheerleader if you wish to keep them long-term. Considering all the pain points mentioned above, let’s consider other ways in hiring remote software developers. Choose a suitable cooperation model based on your business needs and budget – fixed price, time and material or dedicated team, and discuss it in detail with your possible vendors. Lower risk because the reputation of a company is at stake, as it is more likely to be referred by someone. Has a management structure (Leads, PM’s). Managed software development teams require less management due to their well-organized management systems already put into place. Resource backups are available. Most midsize and larger outsource companies have “workers on the bench.” These people are not included in a project team, but in case someone gets sick or leaves the company, they are ready to take on your project as substitutes. This mitigates the risk of down time. Individual resources and full project teams with specialization in all technical responsibilities of a project are likely available. Post product release support structure. Ongoing maintenance of a project is necessary post completion of development. Of course, hiring a managed software development team is less risky than hiring a freelancer, but still, risk exists. Some ways to manage risk are below. Hold regular stand-ups/project updates. Daily updates on current and completed tasks are a must in keeping your finger on the pulse of the project. Try not to pay a flat/blended rate for resources. When signing contracts, you should know exactly how much you are paying for a developer, designer, QA, etc.… It helps make payment process more transparent between all parties. Choosing a partner to fulfill your software development needs is not as easy as it seems. The choice should be based on your primary project goals and then budget and time. Whenever long-term cooperation is involved, hiring a remote development team from an outsourcing company seems like a sounder decision. Hiring a freelancer would be suitable for smaller projects like updating an already developed website or managing content. ← Should I consider AWS for Cloud Computing?